The retail cost of this kit is about $155, but we're selling it for $140.00 - $15.00 in savings! This in general - is an awesome kit! 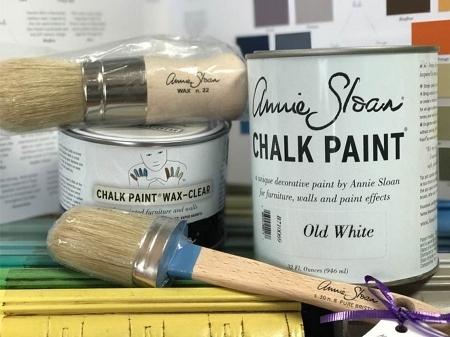 Basically- you complete your painting tool box with this kit- and all you need to do in the future- is just order a different color Chalk Paint®. This kit is very similar to our "Keep It Simple Kit," but it comes with Annie Sloan wax and paint brushes, rather than a Purdy Brush and an Ultimate Wax Brush. The Annie Sloan brushes make a huge difference. They make your projects go much quicker and they make the final product look even better! We named this kit after Hannah - one of our employees...and more so a dear friend after she left us to start a music career. On a side note- Hannah is a pretty special person in my book. She was an awesome employee and amazing friend and extremely hard working. There was "only" about 30 years difference between our ages (she and The Purple Painted Lady) - but I like to think of Hannah as an old soul! I would joke with her that I would adopt her ....but Hannah already has wonderful parents and did not need another set. We all miss Hannah at The Purple Painted Lady...... We miss her singing, her sense of humor, and the dependability of her. BUT we hope that some day we see her on TV or hear her on the radio! She deserves that!